After a couple of months of hiatus, I find myself back at my “Search for the Perfect Chicago Skyscraper”. In this exercise I attempt to review all of the great skyscrapers that have been built in the city that invented and perfected this building type. In this series I have tried to give insight into which is the one that reunites and summarizes the architectural tradition of the Windy City while pushing the boundaries of what was possible at the moment in which it was built. Great architecture is not only about taste, refinement and attention to detail, but also about originality, one that is not limited to stylistic decisions, but that advances certain concepts or technologies that suggest new possibilities. In this sense I approach the several highrises that were built under the guidance of the great Mies van der Rohe. It is no secret that the late German architect pushed many boundaries during his career, perhaps none more visible than his indelible contribution to the development of the skyscraper. Chicago was his home and laboratory for more than two decades during which he completed several projects that defined the modern ideal for the highrise. 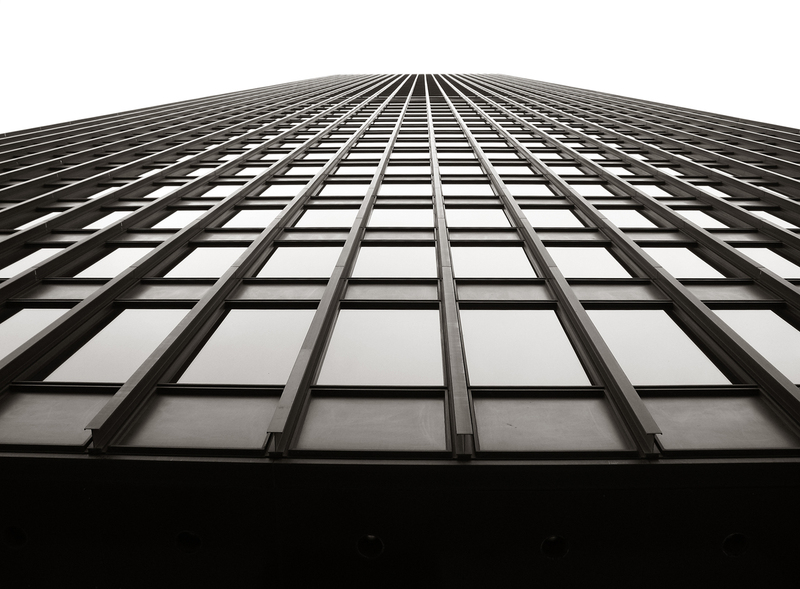 Mies changed the aesthetic, the technology and the stylistic goal of the skyscraper, producing an entirely new breed of buildings that, in most cases, failed to be more than mediocre imitations that did not seek to advance his ideals. The first of all Mies’ highrise designs ever built. Despite its peculiar significance as the first of its kind, Promontory has been overshadowed by the elegant and refined Miesian steel and glass boxes that signified the apex of the modern skyscraper. Promontory is, despite its much more somber aesthetic, a significant accomplishment that signified a departure from the traditional ornamented highrise. In Promontory, Mies revealed the materials that were used in the construction of the building, leaving the concrete exposed, framing glass panels and accentuating the vertical rise of the building. Having been there, I can say Promontory is a far more modest stab at the modern skyscraper, lagging well behind the revolutionary steel and glass skyscraper sketches Mies had once envisioned over 20 years prior. 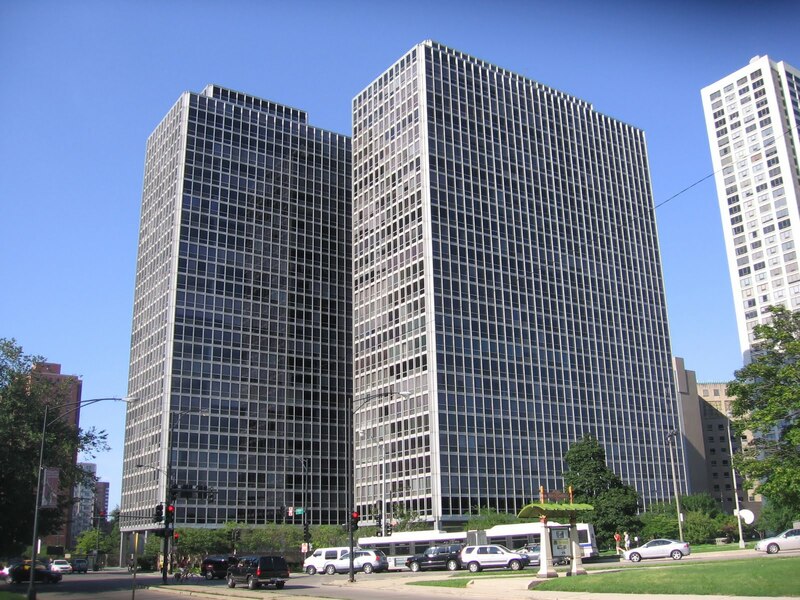 Widely considered one of the finest examples of modern highrise architecture, the apartments Mies designed at Lake Shore Drive overlooking Lake Michigan were, at the moment, a true breakthrough that exemplified, like never before, the simplified “skin and bones” ideal that sought to simplify construction making use of steel, aluminum and glass, eliminating ornamentation. The optimization of the exterior also took place on the interior as Mies was a proponent of the “open plan” that took away partitions to create a more unified space that allowed residents to customize their space with more freedom. In these apartments, Mies used his ingenuity to propose a whole new solution that distinguished itself from all others at every level. It was a specimen that stuck out as a sore thumb, made out of simple and polished lines. For the first time, an architect had produced a high rise that seemed to be a product of an increasingly industrialized world that had discovered a plethora of new technologies and materials that, for decades, had not been used in the making of architecture. 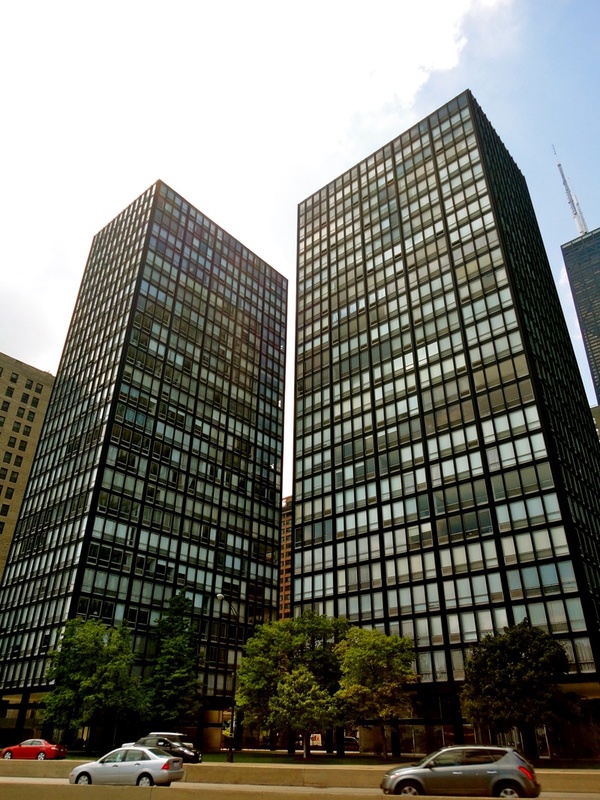 It was the only major governmental project that Mies ever completed in Chicago. It is also his largest, with two office towers that would host the court system of the metropolitan area, a plaza and one of the largest post offices in the city. As it happened during his tenure with the Illinois Institute of Technology, Mies once again had the opportunity to expand his already significant influence upon more than just a single building. In the Federal Center, Mies designed a city within a city, suggesting that his idea of modernity could also expand to create vast ensembles. It is of no surprise that Mies, having already designed a few highrises would seek to concentrate most of his efforts in determining the disposition of all of the programmatic elements on the site. His solution was as detailed and carefully crafted as a corner detail in one of his buildings. The site followed a module that was rigorously implemented at every scale, determining the proportions, distances and placement of all the structures in relation to the plaza. 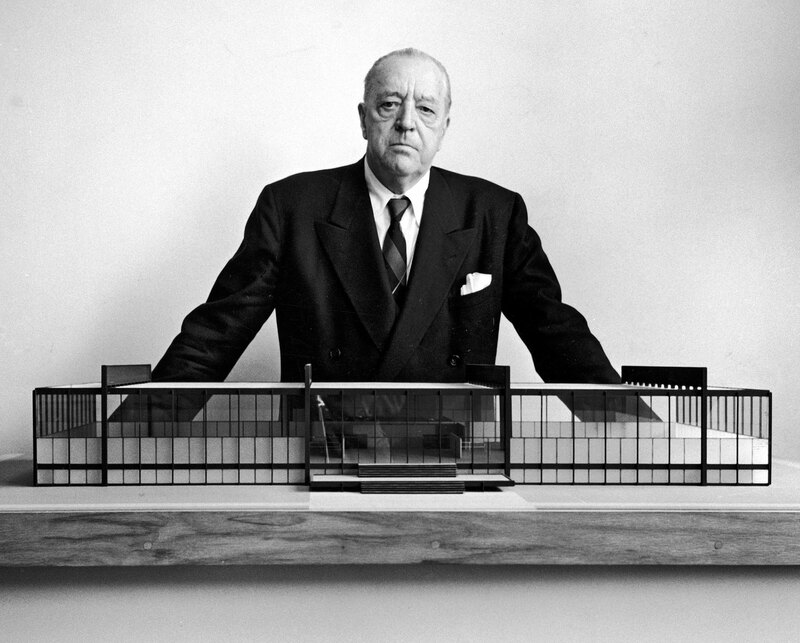 As accomplished as the ensemble was to create a kind of magnanimous atmosphere of stoic public institutions, so was the failure to inspire the rest of us to believe that Mies’ concept of modernity applied better at a limited scale rather than at a larger one. While his skyscrapers were welcomed escapes to the stone-clad ornamentation that dominated the skyline, his cities could have become somber and dark environments without that element of chaos and diversity that enriches and enlivens the metropolitan experience. These residential towers are yet another Miesian study on proportion, construction detailing and modular simplicity. 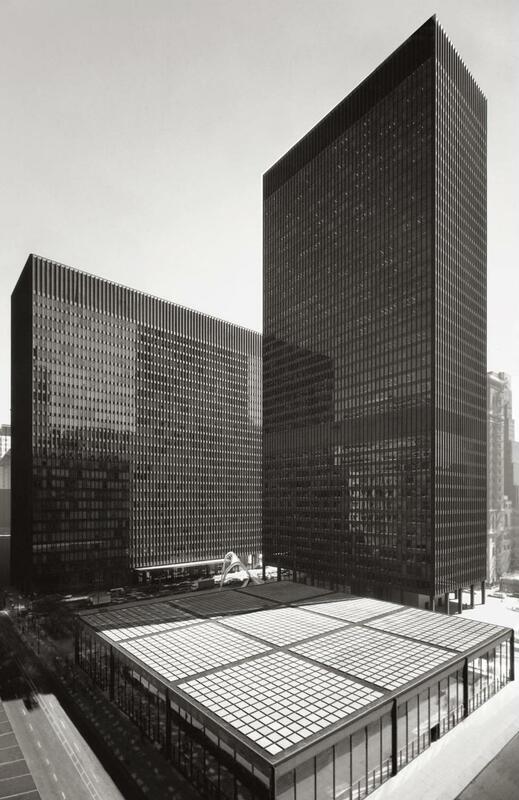 Unlike his other efforts, Mies goes away from the refined black steel and opts for a stainless steel and stained glass skin that gives both towers a very unique look within Mies’ repertoire. While 860-880 seemed to embrace the lake and the traffic next to it, the towers at Fullerton simply face their surroundings without relating to it in a significant way. Their facades appear to be a bit flatter and somber especially from a distance, which take away from the quality of the materials and the craftsmanship that went into putting the buildings together. By changing the material and visual quality of the building, Mies moved away from the distinctive and proven winning formula of his other high-rises. The stainless finish though more expensive, didn’t provide a tangible benefit to the overall aesthetic, taking away part of the elegance that had defined his work in Chicago. It was the last skyscraper Mies was involved in before his death. As yet another showcase of his vision for the modern high-rise, IBM could be considered as nothing more than a refined reiteration of a concept he had begun shaping years prior. Its significance and prominence lays perhaps in the real state it occupies overlooking the Chicago River and how the parcel was used. IBM is set back on the site, with its slender side facing north and south towards the river. The building, unlike its neighbors celebrates the presence of the river with a plaza that, at the same time, makes it more prominent and visible. It is no small feat that Mies was able to convince clients that a taller building was needed if the plaza was to be designed, pushing the tenants away from the desirable river in order to make the building stand out and gain its own identify away from the water body. Among the projects aforementioned, 860-880 Lake Shore Dr. seems to be the more prominent of all of Mies’ contributions to the development of the skyscraper in the city and beyond. 860-880 may not have been perfect, but it was in many ways the first of its kind. It was, arguably, the first of many highrises that successfully followed the ideals Mies had begun to explore decades prior with his famous sketches for an exhibition in the 1920s. 860-880 is also a great example of careful detailing, technological experimentation and revolutionary aesthetic that reflected the possibilities derived from the advances of the industrial age better than any of his other contemporaries.